bet365, in our opinion, is the best place to bet on football, horse racing and all sports Check out the current bonus offer today! Our top rated mobile app. *Ts and Cs apply, 18+ Claim your bonus now! Register with Mecca bingo today and get a £40 bonus when you deposit just £10! Site is only for users over the age of 18. All offers mentioned are subject to additional terms and conditions that can be found on the relevant book makers site within one click of the registration page. We work to keep the offers up to date but these are subject to change at any time. Please gamble responsibly, for details see begambleaware.co.uk. We are committed to providing honest and impartial reviews of all apps and encourage gamblers to bet within their limits and keep gambling as an enjoyable pass time. App security is a key part of our app reviews and we are fortunate that in the UK all the major players we cover also take this ever seriously. you can feel safe in the knowledge that all the apps are encrypted so your personal and payment details are safe and secure whatever betting app you use. In the UK companies have government guidance for cyber security that they are required to follow. Android betting apps have finally made it to the Google Play store years behind Apple due to Googles resistance to offer real gambling on their platform. We've been through and tested all these new apps to bring you our guide to the best apps to download best apps to download. Regardless of if you're looking for in play football betting or horse race streaming we've got you covered. Our reviews cover many key points on the apps including stability, design and ease of use. Ever looked at the iTunes Store and seen how many betting apps there are on there? We have! So we've done the legwork and rated them with our system to bring you the best betting apps for iPhone & iPod touch. With apps being updated and new ones released all the time we're always updating the site with to make sure our reviews are of the latest app versions. We’ll make sure you get the best sports betting apps iPhone has to offer as well as providing you with the best tips, stats and sports news apps in our weekly blogs. Our favourite none betting apps are the racing app Futbol24 live scores and Squawka. Want to find the top betting apps with free bets and promotional offers? Well we've done the legwork for you to bring you our Top 5 free bets and bonuses guide. We cross check the our app review scores with how easy it is to get the free bet or bonus to make our ultimate guide! However we don't stop there as we know its not all just about the opening offers, its about the on going offers too. These days most book makers have on going offers, loyalty promotions or enhanced odds offers for existing customers. When we're rating our top 5 we make sure that we cover these as well. Want to play on bingo apps on iPhone or Android? Then you should check out our guide to the best UK bingo apps. These are real money bingo apps from the top UK bingo companies like Gala, Tombola & Foxy. Bingo apps now feature a wide range of games as well as your standard 75, 80 or 90 ball bingo. These vary from simple slots and scratch card games to unique games like slingo bingo and Tombola's bingo pulse. Companies like Gala bingo also have full casino apps (slots, card games, multi reel slots & roulette) that you can access from your bingo account and use your bingo funds to play with or vice versa. We couldn't find a decent app with betting stats and odds so we went away and built one ourselves. Check out the stats tab on the Bettracks stats app for all the goals stats you need! The app takes recent game data and predicts a % chance of the event landing in the next game - great for finding value bets! The app has been newly upgraded for this season to deliver the stats to you faster than ever before. Gone are the delays in loading and now you can get the stats almost instantly even at the busiest times. Horse racing apps vary in quality - especially when it comes to the size of and the quality of the live streaming. This is essential to us in our testing to find the best apps for betting on all sports. Horse racing varies for the amount of information you get on the horses. We prefer the apps with full from and a write up from TimeForm or the Racing Post, its always good to check out the recent form before you get your bets on. We also have a free horse racing tips site called Bet-Share, it's not an app yet- but could be one day. Most of the major bookies now have casino apps and there are some dedicated casino companies too like Super casino and Grovesnor casino. We've played on all the casino apps to find our top 5 apps. See the best casino apps here. Our testing of casino app covers the usual betting app criteria (performance, design etc) as well as range of slots, blackjack tables and roulette options. We also look at on going bonus offers, as the casino apps are packed with them, and we check out the live casino options at the busiest times to make sure we can get on a table! Poker apps have been the slowest to come to life in the app store with numerous software difficulties in getting the into a decent app form. We've tested the apps to bring you the best poker apps for real money poker (UK based). From sit and play tournaments to video poker we've tried and tested almost all the apps on the app store including Poker Stars and the Betfair poker in play app - a unique way of betting on the results of a hand of poker. GDPR came into play across Europe on May 25th 2018 and applies to all companies, not just betting companies, who contact you. They must now have your full consent to get in touch with you for marketing reasons. You can easily opt out of these when you sign up or in your account settings when you're in any particular bookies app. All the apps we feature are UK based and all must comply with the latest GDPR and privacy regulations. You can now access some of the betting apps we feature on your iWatch or Samsung gear. The actual betting on the watch is limited to a smaller range of markets, but they can be used to cash out which is handy. There are also some decent football apps to get your goal alerts and football updates on your wrist. This is a growing market with more and more applications launching. Check out any iPhone review to see the watch options for that app. If you have an issue with the service from a betting app or betting company then there is a set procedure to make your complaint. You can raise it here with the Gambling commission in the UK and they have a set process to deal with it. This can get a much better response than taking the complaint further with the bookmaker by yourself. It's always good to take a constructive approach to making your complaint - avoid ranting and lay whats happened out in detail with any evidence you have. The most up to date figures for the UK gambling market, to the year end September 2016, show punters in the UK bet an astonishing £13.8 billion (Source) up 64% since the relaxing of gambling laws in 2008. Online betting, casino, bingo and poker accounted for £4.5 billion and we expect that % to rise over the coming years. There's now a wider choice of apps for betting exchange fans with new players in the market trying to break the dominance of Betfair. We've covered other exchanges such as Betdaq and Matchbook to help give you a more informed choice of which exchange to use. This is our preferred way of betting as the options are better for laying off bets and you'll get some great odds on the exchange too. Getting to know how the exchanges work takes some time but if you're a value bettor this is, in our opinion, the way to bet. We review all the betting and sports apps on our site individually and without bias. We are regular users of a number of apps and we keep up to date with the latest updates and design changes from all the major UK book makers. Our reviews are based on a 5 star system. We cover many aspects of the app including design, performance, usability, stability, odds, range of markets, casino and poker options and more. This comprehensive scoring system helps us find the best app for each platform regardless of which bookies app it is. We rate and test the apps on the following criteria - Design, performance, range of markets, range of coupons, ease of bet placement, live streaming and we have recently added "Bet Builder options" as a criteria for the new trending market. We're always on the lookout for more apps to review - head over to our contact us page if you have an app you think we should be reviewing on our site. You can also get in touch if you'd like to query an apps ranking or if you have anything you'd like to ask. Betting apps is run by a small team of UK based sports and betting enthusiasts. We are mainly football fans and our support is divided between Manchester United and Liverpool. See the about us page if you want to get in touch. Between us we've used and reviewed all the apps you'll find on the site. We always have the latest iPhone, iPad and Android devices to review the apps on as well as some older devices to check how they preform there too. By becoming experts in this field we understand what it takes to make a great app for betting or sports apps. Cricket is one of the most popular sports to bet on around the world with the various formats of the game giving lots of betting options. Check out the Betfair app - Our best rated app for cricket betting. It covers lots of markets and the exchange betting is excellent for in play bets. From the IPL to the Ashes Betfair's got all the markets you could ever want on their app. Tennis betting is a fast pace way to bet with markets varying from the outright tournament winner down to the intensity of point by point betting and every thing in between. You get a whole range of markets with most book makers and we include tennis betting in our app scoring criteria. With numerous grand slams through the year as well as lots of tour events to bet on you'll always find some tennis to bet on. The more you built your tennis knowledge around the up and coming players the more you'll be able to spot the upsets! Welcome to Bettingapps.co.uk, one of the UK’s leading websites for all your mobile betting needs. We pride ourselves on bringing you the best bookies apps as well as scouring our all the best offers and odds for you to enjoy! Take a glance through our site where you’ll find our honest bookmaker reviews, as well as the highlighting our favourite bookmaker apps on iPhone and Android. Mobile betting is bigger than ever and we put it at the very forefront of our site. If you have a mobile betting question, we have the answers. Horse race betting is one of the most popular sports to bet on in the UK. Since racing began it has been associated with betting from the early days of on-track betting through to today sophisticated apps to calculate horses based on sets of rules. The above apps all have features that are beneficial to racing fans. They all offer live streaming of UK and Irish racing when you have had a bet on the race. On your phone, the steam will be full screen, on iPad or tablet the stream will be in view screen alongside the in play betting market for that race. Live streaming on races – Usually, you need a 50p/ £1 bet on the race to view. This is usually the same coverage as At The Races has or Racing UK. 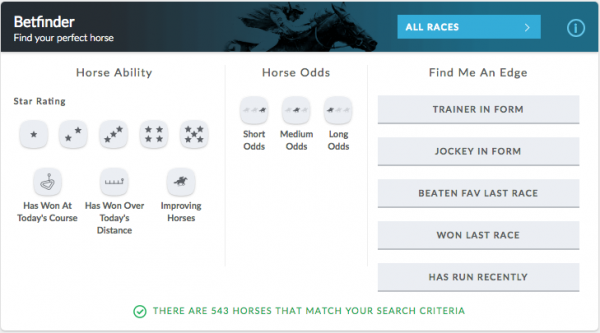 This is something that has become more popular on betting apps over the last couple of years – software that will find horses based on your credentials. Add in what your requirements are and these will find the horses for you to check out and bet on. If you want to find a 4-year-old with the previous form at the track then set the filters and see if any are around. This is a great tool for big events like Cheltenham where you can see which horses have good form at the track. When you open your chosen betting app you’ll see that most offer racing form in some way or other. The better apps also include small write-ups from either the Timeform team or the Racing post, but what does the rest of the form mean? Here’s our simple guide to how to read the racing form. A number – This is a completed race and the position they finished. An “0” means they finished anywhere outside the top 9. U – Unseated rider (basically the rider came off the horse during the race. Betting apps are built on a range of different software that underpin the technology. This goes some way to explain why there is a lot of apps that are similar in appearance to each other, especially in the casino and bingo sectors. We’ve covered some of the main software as a guide and tried to find who is using what. There are a couple of companies whose apps are self-built, namely the William Hill app and the bet365 app. With more than 5,000 employees spanning 17 global locations, Playtech is one of the biggest global software players on the betting scene. Their proprietary technologies include the Playtech Information Management Solution (IMS); Business Intelligence Technology (BIT); the Playtech Portal and the Playtech Open Platform (POP). Beyond apps on iOS and Android, their software also powers websites, desktop apps, fruit machines and even bricks and mortar bingo halls, making Playtech a genuine omnichannel software company. This allows the gambling powerhouse to offer ‘cross-product’ suites, which offers players a seamless experience – with a single account and wallet – when using an app or website across multiple devices. With in excess of 600 casino games to their name, Playtech has the most extensive portfolio of casino games covering all channels and every device, and also provide the technology behind iPoker – the world’s largest regulated dot.com poker network. Other gaming and betting categories Playtech cover include bingo; live dealer; sports; and virtual sports. Over the years, Playtech has acquired tens of gaming content creation companies, games studios and software suppliers (including Origins, Ash Gaming, Sunfox and Vikings in the casino category; and Virtue Fusion, ECM Systems and Eyecon in the bingo category). Also separating them from their competitors is the fact that Playtech provides solutions to B2B, as well as to B2B. Enetpulse provides a wealth of live sports data over multiple channels, delivering scores, results and stats through their XML & API data feeds, as well as front-end solutions to betting brands such as 10Bet, Betfair and Sportingbet. The sports data feeds are compatible with virtually any digital platform – such as online media, televisions, mobile/tablet, consoles and Teletext. Data types include live scores and results; fixtures and standings; live stats; performance stats; action zones; historical data; odds comparison and special events. Alongside data streams, Enetpulse also provides hosted betting mini-sites and ready-built sports data widgets that are drag-n-drop customisable and easily integratable. Novomatic is the titan among betting app software companies, turning over €2.5 Bn in 2017 alone. Notable slot gaming titles of Novomatic’s include Dragon’s Pearl™, Pyramid Fortunes™ and Wave Patrol™, among hundreds of others. They also boast four gaming platforms under their name: NovoLine, CoolFire, Impera and OctaGames. Evolution Gaming specialises in live casino games (their roulette category alone has 12 variants of roulette – ranging from Live French Roulette to Live Slingshot Auto Roulette). However, their technology also provides services for an array of global betting brands – including 888 Casino, Betway, Betvictor, Partycasino and William Hill. The key components of the integration of their technology include a third-party integration engine; one-wallet integration funds transfer integration and Live Casino Administration System – Back Office. With 12 years in the industry, Evolution Gaming today turns over €175.2 Million across 11 regions. Betting Apps is run by a small team of UK based sports and betting enthusiasts. We are mainly football fans and our support is divided between Manchester United and Liverpool. Take a look at our About Us page for more information and how to get in touch. Between us, we’ve used and reviewed all the apps you’ll find on the site. We always have the latest sports betting apps on iPhone, iPad and Android devices reviews as well as some older devices to check how they perform there too. By becoming experts in this field we understand what it takes to make a great app for betting or sports apps. As mentioned above we regularly bring you the best betting app reviews from across the web ensuring you’re delivered all the latest information including their functionality, markets and best offers within the app. This will come across everything from sportsbook apps to casino, poker and more. We’ll find you the best odds app, the best offers app, as well as the best bookmaker app iPhone and Android, has to offer. We really are your one stop shop for mobile sportsbook betting. Outside of sport we also do our best to provide you with the best mobile apps across the likes of casino, slots bingo and more. Here at Betting Apps we love a good offer. It’s why our expert team do what they can to ensure you’re delivered with the very finest. We’ll bring you the best mobile free bets, no deposit free bets, enhanced odds and money back specials. With every review, you’ll be highlighted with the finest offers they currently have, as well as how to sign up with them. Betting apps have evolved over time to the super sharp and quick apps we have today, but this wasn’t always the case. When Apple first launched the iPhone in 2007 they didn’t allow real money Gambling on their App store – exactly the same as Google on the Play Store. The iPhone really took off and so did apps but initially, Apple stood firm on their stance on gambling. We launched our site in 2010 and to start with we provided guides on how to install a web app to your phone – This seems so dated now! Here’s how bet365 mobile looked back in 2010! It wasn’t until 2012 that Apple softened their stance and started letting the likes of William Hill and bet365 to launch App store versions of their mobile sites. These were an improvement on the mobile sites but still a long way from today’s apps. Over time the apps improved greatly along with the speed and range of markets. In 2016 Google finally caved and started to allow real money gambling (Sports betting, casino apps, poker apps & bingo apps) app on the Play Store. All through these changes, we’ve continued to test and rate the apps to share with you the best betting apps regardless of your phone. While all apps have their advantages we still feel that some have an edge over others. Just for fun here’s how the early William Hill mobile app looked – It used to be called “mobet”! Here’s our comprehensive guide to betting on mobile or via apps – If you have any questions send us a tweet to @bettingapps and we’ll add it to the list. One of the best things about current apps are the options for live streaming, from high-level football like the Bundesliga to the more niche sports like handball (It’s a Scandinavian sport – check it out, it’s brutal!). There are varying rules on the requirements needed to watch – usually you need to have an account with money in it, or have placed a bet in the last 14 or 30 days. Some events, mainly horse racing, are bet to watch – place a £1 bet on the race and you can watch it. Which betting apps offer live streaming? Almost all the major bookmakers offer this, check out our best app pages for your phone – All the top 5s offer streaming. Why can I now stream some events in the UK? In some cases, it may appear that an event can be streamed, usually displayed by a video icon by the game, but it may be geographically restricted. For example outside the UK some bookmakers will show the Capital One Cup to residents in Europe but due to broadcasting rights, they can’t show it to anyone in the UK. This is picked up by the location of your IP address when you log in. Why won’t the app steam in full screen? This is usually the case on iPad apps or on Android tablets. The bookies want you to have a bet on the app as well as stream the game so on the larger screens they’ll display the action in a smaller screen so you can see the odds and bet at the same time. On your phone, there isn’t enough room so most events can be shown full screen, but you then have to close the stream down to place a bet. You know what it’s like – every time you download a new app you get asked if you want notifications on. With bookies you may or may not do – that’s up to you. Most betting apps now give you notifications on games you’ve bet on with the standard goals and full-time results. Some will offer additional notifications such as cards, corners and other options. This is a great way to keep up with the games you’ve bet on but is a little annoying if you’ve got a 15 bet accumulator on a Saturday afternoon! How do I stop notifications from my betting app? You may need to do this in your phone’s settings rather than the app settings. On iPhone head to setting> general> notifications scroll down to the list of apps and just knock notifications off. On Android follow the same steps heading to setting and turn off all notifications on the app. Where can I get corner notifications? We hear you on this one! Until recently no one has offered corner notifications but recently for us, the bet365 app has started to. We are not aware of any others doing this currently. This is great if you’ve got a bet builder or similar on. What is the most downloaded betting app in the UK? Unfortunately, this is not something we get data for as the app store does not share this information and the bookies also do not share this information. The best guide we get is on the Google Play store and the downloads are grouped together. Football is by far the most popular sport to bet on and on big games, you usually get a choice of over 125 markets to pick from, but where do you start with that! Here are some of the more popular markets and a quick look at the options, we’ve avoided the WDW and the Over/ Under. Both teams to score – Simply a question of will both teams score a goal with a straight yes/no answer. There are some good value options on this one too including to win and both teams to score and the difficult to predict “Will both teams score in both halves” market. This has some very high odds and you occasionally see some massive wins on social media but it is so tough to even get 1 game right let alone 3. Corners – Always a popular side market is corners betting. Again there is a good range of markets to go from starting with the simple over and underlines. These can be anywhere from 6.5 to 12.5 depending on the game. There are also corner match bets and Asian handicap corner bets. Make your own bets – These first came about via Sky Bets #Requestabet on social media where you could tweet them a bet for a game and they’d price it up. After being overrun with demand for it other bookies moved in and now these bets are all priced up for you on the app. Head over to any game and you’ll find other peoples options showing as well as the option to select your own. These all have various different names – Bet Victors is #Priceitup, William Hills is #Yourodds, Ladbrokes is Get a Price and my personal favourite is bet365s bet builder. Here are some frequently asked questions if you’re having an issue with any betting app in the UK? Why do the odds change when I’m placing a bet? This happens a lot if you’re betting in play. The odds change based on time and events in the game. There is usually a 7-10 second delay between you pushing the place bet button and the bet placing. This is so you can’t be live at a game and get a bet on before the news has hit the bookies about what is going on. Someone in Australia was recently arrested for getting bets on the tennis from in the stand before Betfair got the notification of the points. Why can I not install some apps? The UK has some of the toughest gambling legislation in the world, where gambling is legal. You’ll be pleased to know that not just anyone can rock up and launch a betting app! There are steps to go through and you need to prove you’re a fit a proper company and have the finances in place to cover customer wins. Once they’ve been through this process they will be given a license by the gambling commission in the UK. They’ll usually be registered as a gambling company too in either Gibraltar or Malta where most operations are based for tax reasons. If you have any doubts about a betting app being legitimate then look for the license information – it should be shown somewhere on the app. If you’re near a computer then the information is always in the footer of the website. You can then check its legitimate here. You can also report any issue to the commission too.